The Icefields Parkway is one of the most scenic roads in the Canadian Rockies and links the mountain communities of Jasper and Lake Louise. In summer it’s a busy road with tourists at every viewpoint, groups of cyclists completing the 143-mile bike tour, and trail head parking lots filled with backpackers and day hikers. In the off-season however, the parkway receives little traffic other than that from backcountry skiers heading for the area around Bow Summit, or Ice Climbers heading for the Weeping Wall. 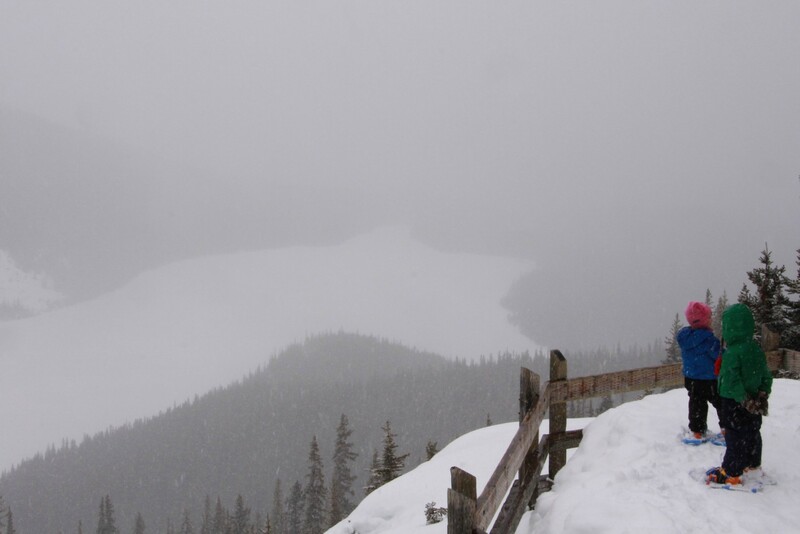 A handful of snowshoers may make the journey past Lake Louise on a given weekend and a small portion of Calgary’s downhill skiers will make the trek to Jasper’s Marmot Basin on a Friday night after work. This isn’t a highway where you want to run out of gas or have road problems in the middle of winter. Even driving the Parkway can be a challenge in winter between the months of November through April. All that being said though, the Icefields Parkway is a beautiful place to explore in winter and should not be something to be scared of if you are a competent all-season driver in a winter-safe vehicle. Last weekend’s adventures took us from Calgary, past Lake Louise, and along the Icefields Parkway to the Hilda Creek Hostel and backcountry paradise for skiers looking for lines on nearby Parker Ridge. The hostel is located approximately 3.5 hours from Calgary and 69 miles North of Lake Louise near Sunwapta Pass, one of the highest vehicle accessible points in Canada. Our weekend plans wouldn’t require skis, avalanche beacons or shovels though. 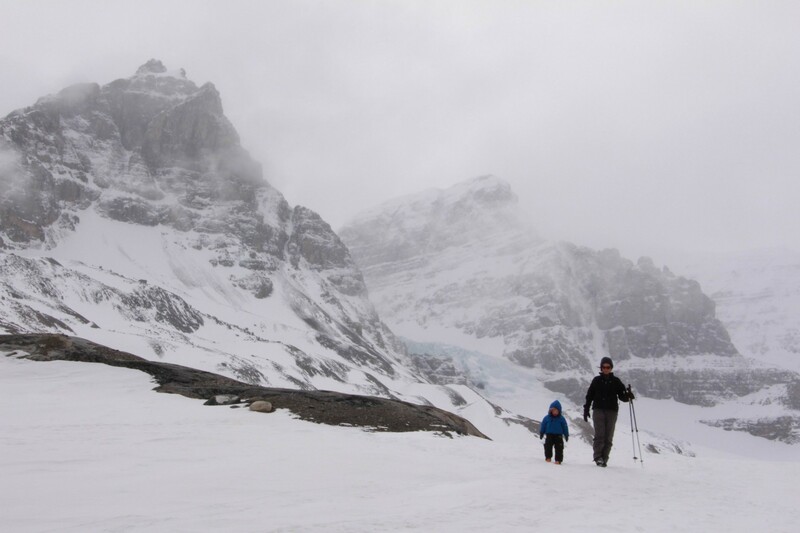 We planned to stay at Hilda Creek with another family and use the hostel as a basecamp for some easy snowshoe hikes. Before reaching the hostel, we stopped at Bow Summit to do the popular hike to the Peyto Lake viewpoint. In summer you’d be fighting for space on the trail and even challenged to find a parking spot on a long weekend. April was a bit of a different story. We didn’t see a single person on the trail or at the viewpoint. It’s the first time I’ve ever had this magnificent vista all to myself with just friends and family. While we weren’t able to see Peyto Lake’s beautiful aqua blue color, the solitude was very enjoyable and I’d do the short one-mile hike again in winter. It was the perfect distance for small children such as ours and the trail was easy on snowshoes. It was well packed down and we followed a wide summer road to within a very short distance of the viewpoint. We did run into other folks on the way down but they were all on skis and had been up enjoying the powder that Bow Summit is famous for in winter. 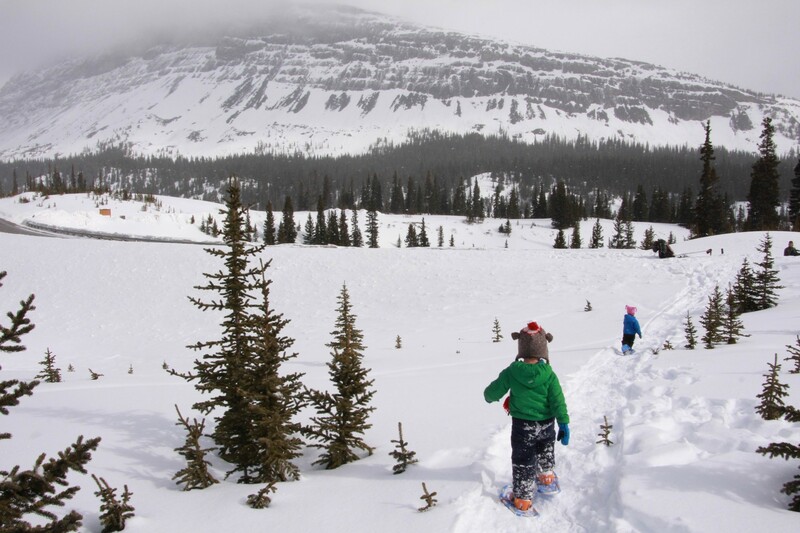 After finishing our short hike to see Peyto Lake we drove the last hour to the Hilda Creek Hostel and tried to convince our junior campers that they would need to don their snowshoes again for the short walk to the cabin. While the hostel is considered a front-country property, parking is located in a small lot off the highway and access to the cabin is via a short descent through the woods. We finally decided to pull the kids to the hostel in sleds to save energy for later adventures building snowmen and snow caves. The sleds also came in handy to haul coolers and duffel bags to the cabin. While I’m sure we could have travelled in backpack style, we hadn’t been quite that organized or efficient in packing. Coolers just seemed to make sense and beer was a bit less heavy on a sled than on our backs. The Hilda Creek Hostel is actually made up of two separate cabins situated side by side. The main cabin houses the kitchen and eating quarters with a clothes line for wet clothes. Meanwhile, the second cabin provides bunk beds for 6 people along with basic mattresses and pillows. Travelers need to bring their own sleeping bags as there is no custodian or manager on duty at this hostel to do laundry. It’s a wilderness hostel in its utmost simplicity. You’ll find outhouses down the path from the sleeping cabin and a creek a little further away that you’ll use for drinking water and cooking. Now, doesn’t that sound like a place you’d like to take your children for a weekend? For us, the answer is Yes! A thousand times, yes! It was a very safe and controlled version of winter camping. We slept and ate in warm propane heated cabins, had propane fueled lanterns and a stove at our disposal, a dry place to retreat and hang wet clothes, and comfortable beds to crawl into at the end of the day. I’ll personally take that any day over the real deal of winter camping in the snow. When we weren’t drying off or warming up, we were outside playing in the snow, working together to make a snowman, and sliding down the toboggan hill located immediately outside the kitchen door. It was pure paradise and the kids had a blast at their winter camping house. 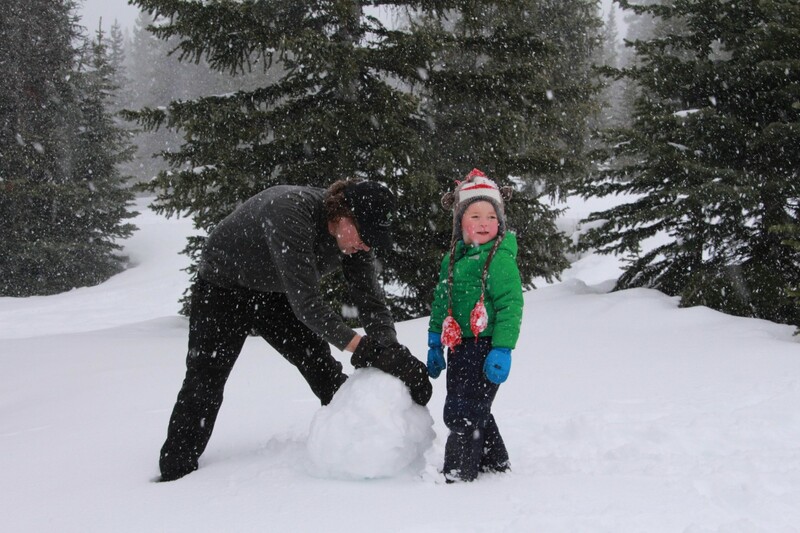 We only stayed a night but we made full advantage of the snowy wonderland and had the snowsuits on bright and early again the next morning before packing our gear out and locking up behind us. It was considerably sunnier on our departure day so we decided to do another hike before heading back to the city. 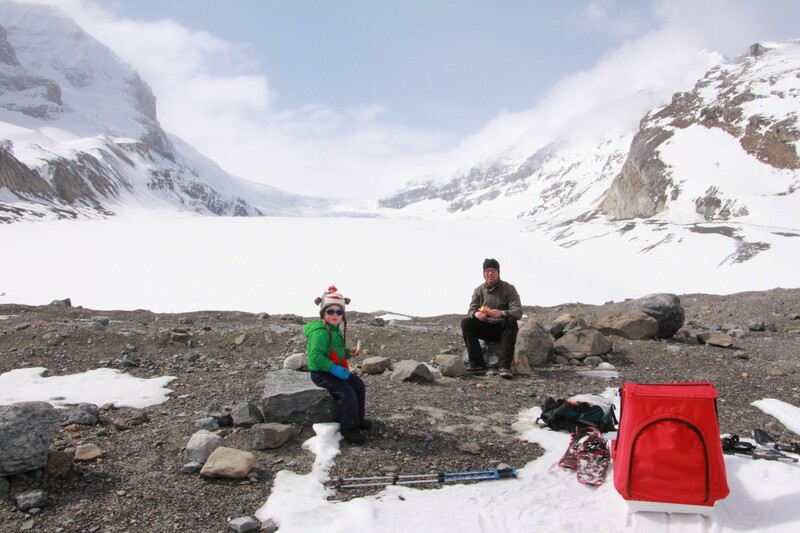 We chose to hike to the toe of the Athabasca Glacier at the Columbia Icefields Centre a few miles down the road. The Centre is your starting point for glacier tours in giant snow coaches and opens mid to late April every year. 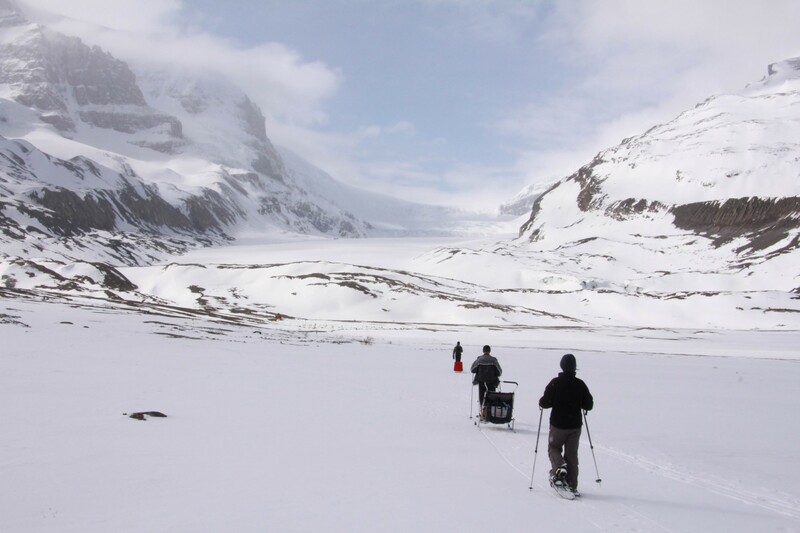 We had the opportunity to take one of the tours onto the Athabasca Glacier last fall but this time we wouldn’t be stepping on to the actual ice. We just wanted to hike up to the glacier, have lunch, and take in the breath-taking views of 11,000 foot peaks towering over us. We towed the kids in sleds and climbed our way up a viewpoint looking down at the glacier. The Athabasca Glacier is Impressive in its own right but what you can’t see is the mighty Columbia Icefields above. 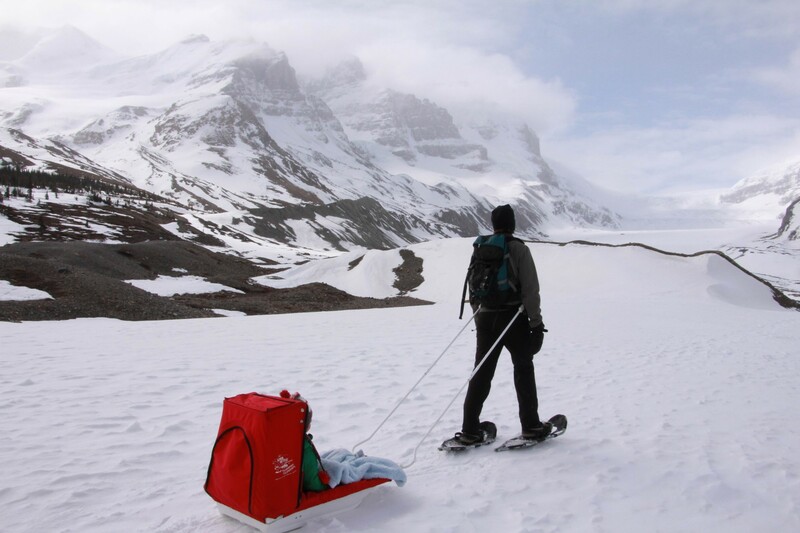 At 126 square miles, it is the largest Icefield in the interior of North America – and someday I will embrace winter camping just to get on top of the massive sheet of ice and climb up some of the easy peaks. The hike was less than two miles in distance return and we could have done it without snowshoes. There would have been some postholing, but we could have made it in boots. We chose to snowshoe however because it meant the kids could ride. Happy kids make for happy parents in the long run. The glacier just looked like a giant field of snow with the ice covered up by the winter drifts, but I still enjoyed the hike without the crowds. As with Peyto Lake, it was nice to enjoy a popular summer hike in peace. We met very few other people on the trail and cherished this experience. We stopped at the just-opened Saskatchewan River Crossing on the way home for coffee and French fries before making our trek back to Calgary. We know we’ll be back at Hilda again in an upcoming winter and next time we’ll hike around Bow Lake. One or two more winters and the kids should be up for the 5.5 mile return trip to frozen Bow Falls. We’re also plotting a summer trip to Hilda Creek so that we can hike the Parker Ridge and Wilcox Pass trails with the kids. The last time we stayed at the hostel in summer was when our son was only a year old so I’d say it’s time for a return visit! While we chose to do easy snowshoe hikes, trips of a more challenging nature are plentiful along the parkway. Helen Lake, Cirque Peak and Crystal Ridge beckon to adventurers wanting to navigate through moderate to advanced terrain. Backcountry knowledge along with avalanche safety training are both necessary on these routes. For more information on snowshoeing the Icefields Parkway, you can grab a copy of Andrew Nugara’s book “Snowshoeing in the Canadian Rockies.” Published in 2011, it should be the first book you buy if you are planning a winter vacation for snowshoeing in Banff National Park. 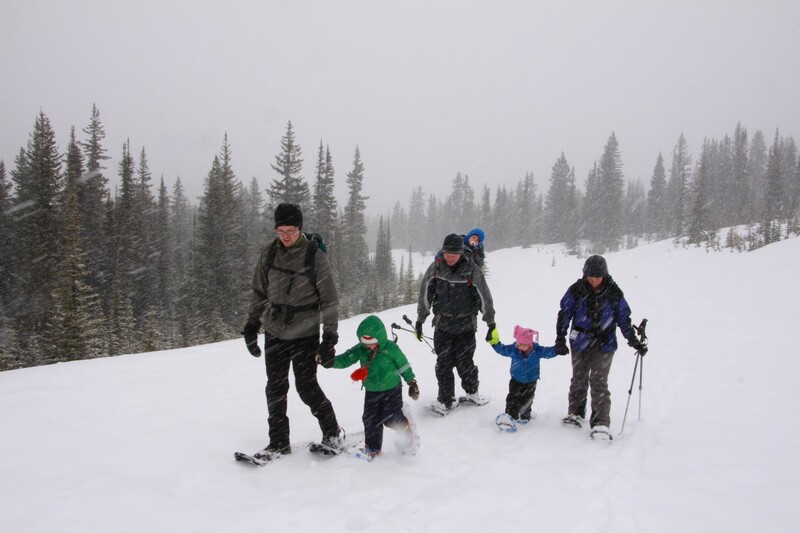 Families or novice winter adventurers may want to start with Nugara’s “Beginner’s Guide to Snowshoeing in the Canadian Rockies” first. It has given us many great suggestions this winter and we plan to explore its easy trails over the next many years as a family. For more information on Hilda Creek or hostelling in the Canadian Rockies, visit the Hostelling International website. There are five choices for wilderness hostels on Highway 93 (the Icefields Parkway) and five additional wilderness hostels located throughout Alberta and BC. 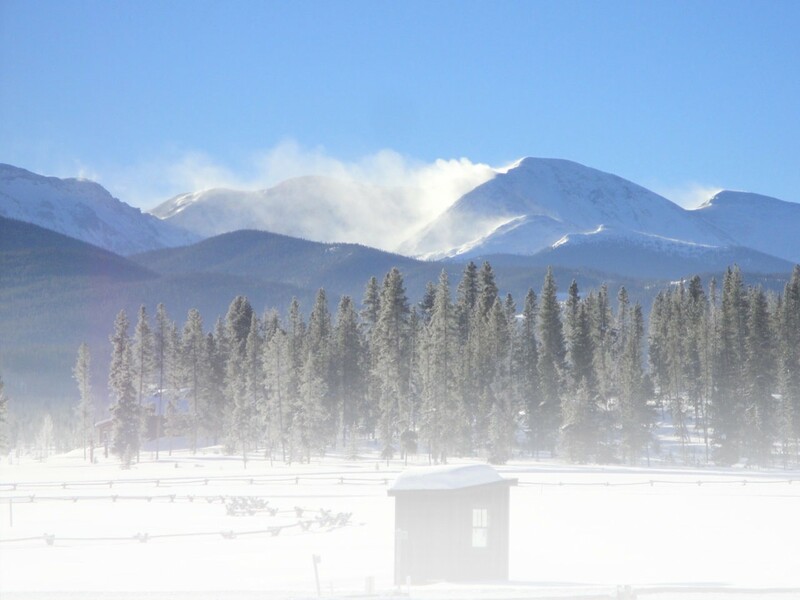 Each hostel makes an ideal basecamp for ski or snowshoe adventures in winter or hiking and climbing trips in summer. Disclaimer: Hostelling International graciously sponsored my family’s trip this past weekend. As always, all thoughts and opinions are entirely my own.